Selling Gold? Here’s a few tips before you sell. Gold is still on the rise. 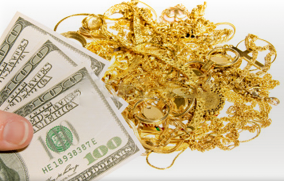 Are you considering selling gold jewelry? If so, before you sell, here are a few tips that will help you. First and foremost, find a local, licensed precious metal buyer. There are many individuals and “businesses” that do not have the proper license to purchase gold, silver and platinum. They are operating illegally and generally do not pay you what your items are worth. Check out “reputations” online with BBB, Angie’s List, and other consumer review sites on the web. Customer experiences will help guide you where to go. Avoid sending your gold jewelry to a buyer through the mail. This is scary. You really don’t know where it’s going, how it’s being processed and what the value is until they get back with you. Go to a local buyer. The Antique Road Show is famous for evaluating antiques. Many buyers try to emulate them by setting up shop in a hotel lobby for the weekend and advertise in newspapers for a “weekend buying event”. Stay clear – they are not the Road Show! These type of gold buyers are notorious for low payouts. Pawns are in the loan business, that is how they make money. There offers are usually less than a gold buyer. Be careful of jewelry stores that offer you a large payout – in store credit. In-store credit is not the same as a cash payout. This allows the jewelry store to sell you more over-priced merchandise making you think that you are getting the best offer. If you go to a local gold buyer, be sure to have ALL your items tested in front of you and then weighed by karat. This ensures that you are getting paid for 18k jewelry as 18k gold and not weighed in with 10k gold which pays less. One of the most important tips is to get a quote from whoever you are in front of BEFORE you say what you want. A lot of times customers are not aware of how much their gold is worth. If they ask you “how much do you want?”, do not walk, run out the door. You are about to be taken advantage of. Make them quote you first. Shop around, get some quotes. Get written quotes, with the price of gold and the weight of your items. Gold does go up and down hourly like the stock market, prices are subject to change and this will ensure that if you go back you get what was offered. If a shop will not give you a written quote, again, run! These tips should help you get the maximum price for you when you sell gold jewelry. If you live in the Palm Beach County area and are considering selling gold, then put the Lake Worth Gold Mine on your shopping list for the most competitive offer. Is it time to sell your sterling flatware?